When we revamped and centralized our UI preferences in October, our goal was to simplify things, particularly for new users. There was one change that a good number of power users didn't like though, that change being that the same trend preference didn't always make sense for all of their sites and/or dashboards. Previously the trend was a dashboard preference, and each dashboard is tied to a specific site, so for some power users the old set up was better. To address this complaint, we've added a new trend menu in the top right corner that allows you change your trend preference on demand. 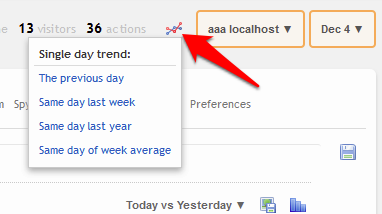 When you change the trend option, it's saved to the database immediately so it sticks with you as you move to new reports and/or sites in your account. I like this new method quite a bit, it's really nice to be able to change it on demand while viewing a report, to compare different trends quickly and easily. And having this menu front and center, more people are aware there's even a trend preference in the first place. (Even with the new set up in October, there were still not nearly enough people aware of this option). We didn't have enough horizontal room to create a full menu button that would display the current option, hence the choice of using an icon. Hover over the icon to show the current setting. This particular aspect isn't necessarily ideal but it was the only design that we felt worked.